Great news! Multi modal transportation options will enable more people to get around the city without cars! Plans to make Asbury Park a more walk and bike friendly community advanced this month with the adoption of a master plan by the Asbury Park Planning Board and a proposal for adding e-scooters and e-bikes to the city’s existing bike share fleet. Transportation Director Michael Manzella said benefits include reducing traffic congestion and parking demand, encouraging the use of public transportation, and reduction of vehicle emissions and air pollution. Road Diet Support From Tri City News! Pick up a copy of Tri City today! As you drive on Main Street, “traffic calming” is what you’re experiencing. It’s the driver response to a street that feels narrower, and where there’s a need to be more aware. Drivers seem to have adapted, and they’re driving more safely, even though it isn’t pretty. Right now Main Street is in the process of repair, with obstacles like barrels, trucks, and potholes which “calm” traffic. When the project is finished there will be a calmer flow of traffic, because of only one north and one south lane, bike lanes, and a center turning lane. Drivers will find that they’re getting to their destinations without losing time, and without needing to zoom traffic light to traffic light. A small city like Asbury Park is perfectly positioned to implement infrastructure like the Main Street Road Diet, and to adopt The Asbury Park Plan for Walking and Biking, which Doug references. We’re at #peakcar. #toomanycars. With bikeshare, jitneys, electric cars, and other transit options Asbury Park can be a model city for getting around safely walking, biking, and with or…without a car. For many years, much of the focus in engineering city streets has been how to efficiently move cars. Asbury Park is among other forward thinking cities globally where we’ve realized that safety, and PEOPLE should be the focus. Cars are often needed to get to destinations, but within the city there are much better, healthier, and safer ways to get around, especially for many residents who do not own cars at all. We’re so fortunate to have Transportation Manager, Mike Manzella and advocate members in Asbury Park Complete Streets Coalition who can help educate, and partner with residents, businesses and police to make this city truly walkable and bikeable. Stay tuned for more ways in which Asbury Park will be creating better ways for people to move about the city without a car. This week, Amsterdam is taking its reputation for pro-bike, anti-car polices one step further by announcing that it will systematically strip its inner city of parking spaces. Amsterdam transit commissioner Sharon Dijksma announced Thursday that starting this summer, the city plans to reduce the number of people permitted to park in the city core by around 1,500 per year. These people already require a permit to access a specific space (and the cost for that permit will also rise), and so by reducing these permits steadily in number, the city will also remove up to 11,200 parking spaces from its streets by the end of 2025. The cleared spaces won’t be left empty, however. As room for cars is removed, it will be replaced by trees, bike parking, and wider sidewalks, allowing Amsterdammers to instantly see and feel the benefits of what will still be a fairly controversial policy among drivers. Do Wider Streets Move Traffic Better? Some drivers and traffic engineers believe that making streets wider will effectively provide for more cars and make traffic move more efficiently. Learn more here. 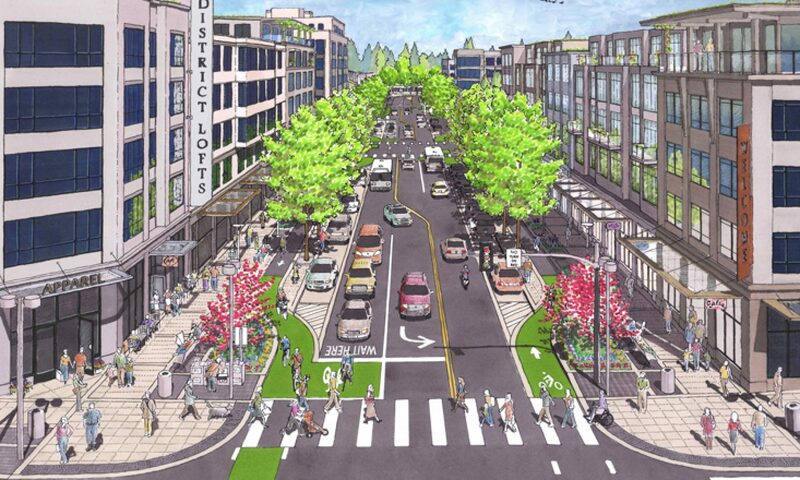 In urbanism, “induced demand” refers to the idea that increasing roadway capacity encourages more people to drive, thus failing to improve congestion. Since the concept was introduced in the 1960s, numerous academic studies have demonstrated the existence of ID. We’ve hit peak car. People are complaining about traffic, and lack of parking in Asbury Park and in cities all over the US. Building wider roads was never a good idea (induced demand), and it isn’t feasible or economically a great idea to build more parking (Cities are eliminating parking.) Maybe car culture in the US is about to change.